The five-time AL West Division Champions, the Texas Rangers are looking to hang more banners while striving to bring a World Series Championship to Arlington. They face stiff competition with the newly arrived Houston Astros and the Los Angeles Angels of Anaheim to capture another division crown. The Texas Rangers’ performance in the 2015 and 2016 seasons was commendable. Although the team was eliminated from the playoffs twice by their rivals, the Toronto Blue Jays, they managed to take home the West Division title on both occasions. The Rangers have never won a World Series. Will this be the year they finally bring the trophy home to Globe Life Park? To find that out, you have to get your 2018 Texas Rangers tickets now. On the road to the World Series Championship – The Texas Rangers qualified for the playoffs in the 2010 season and met with the New York Yankees in the ALCS. The Yankees won the first game of the series but the Rangers bounced back and returned the favor by winning the second game. These two continued to compete until they reached Game 6. By then, the Rangers were leading the series 3-2. It was all or nothing for the Yankees when they collided with the Rangers on October 22, at the Global Life Park in Arlington. Fortunately for the Rangers, The Yanks came up short which led the former to square off against the San Francisco Giants for the World Series title. Rangers Vs Cardinals – In the 2011 season, the Texas Rangers made it past the regular season and won the ALDS and ALCS against the Tampa Bay Rays and the Detroit Tigers respectively. Their fans later saw the Rangers cross paths with the St. Louis Cardinals for the World Series Championship. Both teams fought tooth and nail to capture the top prize. The Rangers and the Cardinals were tied 3-3 at the end of Game 6 which led to Game 7. The pressure was on both sides but the Cardinals were better that day as they emerged victorious 4-3 on October 23, at the Busch Stadium. The Texas Rangers share heated rivalries with the Houston Astros and the Toronto Blue Jays. Rangers-Astros Rivalry – This rivalry between the two teams is also known as the Lone Star Series. It was established as part of interleague play as the Rangers are members of the American League whereas the Astros were members of the National League. The Astros joined the American League West in 2013 which turned their rivalry from an interleague to an intra-division one. The last game between these two sides was played on August 31, 2017, at the Tropicana Field where the Astros won 5-1. Rangers-Blue Jays Rivalry – The rivalry between the Texas Rangers and the Toronto Blue Jays started when both teams collided in the 2015 ALCS campaign. The final game of the series between the Rangers and the Blue Jays was held on October 14, at the Rogers Centre. The Jays won that bout. After their bitter defeat, the Texas Rangers got the chance to even the score when these two sides locked horns in the 2016 ALCS but unfortunately, they were defeated once again, 3-0 which further intensified this rivalry. The Texas Rangers were established over five decades ago in 1961. The team has won seven West Division titles and two AL Pennants. Rangers Baseball Express, LLC is currently the owner of the franchise. The Rangers ballpark is called, Global Park Life in Arlington. The venue has hosted many sporting events including the Dallas/Fort Worth MDA Muscle Walk in 2014. Globe Life Park In Arlington has to be on your MLB Stadium bucket list. Centered in the heart of Arlington, this 48,000 retro-style venue provides fans with a unique game day experience. Take a stroll through iconic "Greene's Hill" or walk through the many parks surrounding the grounds. Make sure to try “The Choomongous” during your visit! There is a long list of talented athletes who played for the Texas Rangers. Among them is Iván Rodríguez. He has been inducted into the team’s Hall of Fame. Moreover, while he was with the Rangers, Iván went on to appear in the All-Star game ever year from 1992 to 2001. He also won multiple Silver Slugger Awards. Then, there is Nolan Ryan who played for the Rangers from 1989 to 1993. The team not only honored him by retiring his number 34 but also inducted him into their Hall of Fame. Nolan was also named as the Strikeout Leader twice while he was with the Rangers. Another star player who remained with the Texas Rangers for over a decade from 2000-2012 is Michael Young. During his time with the Rangers, he played in seven All-Star games and won a Gold Glove Award in 2008. Watch the Rangers live in action! The 2017 MLB season has begun. Many teams have set their sights on the World Series Championship including the Texas Rangers who have never won it since their formation in 1961. If you want to watch them perform this season then, wait no more and get your hands on Texas Rangers baseball tickets today. Our process for purchasing cheap Texas Rangers tickets is simple and fast. There are so many online ticketing sites, that it can be hard for customers to find the right place to buy Texas Rangers tickets at the cheapest price. At ScoreBig we think of our customers first and foremost. We offer daily deals for Texas Rangers events, so our customers can get the best seats for the best prices. ScoreBig will always go above and beyond to offer the cheapest Texas Rangers tickets on the market. The Texas Rangers schedule above, displays all available events for 2019 and 2020. Once you find the event that you would like to go to, click the red “Get Tickets” button. It is located on the right-hand side of the event listing, it will take you to an Texas Rangers event ticket page. ScoreBig's event ticket page will display all available Texas Rangers tickets for that event. On the event ticket page to help with your search for the right Texas Rangers tickets, use the filters at the top to select quantity, price range, and more. There is also an interactive seating chart so you can pick where you want to sit. When you are ready to buy a ticket, click on the listing, and you will be directed to ScoreBig's checkout page. Upon completion of the information fields, your order will be processed and your Texas Rangers tickets will be delivered via email, mail, or to your mobile device. What makes ScoreBig’s site stand out from the rest? We are constantly analyzing our competitors to improve our site, service, and prices. ScoreBig.com employees strive to offer the best process and experience to buy cheap Texas Rangers tickets. Our goal is to get you the best seats to Texas Rangers events. We offer daily discounts on our site and for special promotions check out our newsletter. If there are no Texas Rangers events currently available, you can use our search feature at the top of the page to see a list of all popular events going on near you. No matter your price point, we have all the best deals and discounts on Texas Rangers tickets. For more information on prices of Texas Rangers tickets and the schedule for Texas Rangers, check out our listings above. The last thing you want to find out is when the Texas Rangers event you wanted to go to is sold-out. Don’t worry in many cases ScoreBig has affordable tickets to sold out events. We sell tickets from GA all the way to premium seating and parking. Skip the scalpers in the parking lot and get your tickets online from top Texas Rangers ticket brokers. We get you in all events, buy your Texas Rangers tickets here from a brand that many trust and rely on for all their ticketing needs. ScoreBig offers a 100% money-back guarantee. If you have been in search of cheap tickets for Texas Rangers, ScoreBig by far is the best option. That’s why ScoreBig has more loyal customers than any other ticketing site. 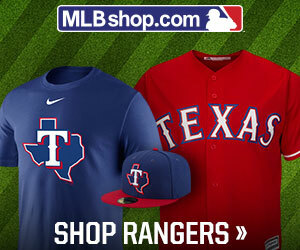 Shop at ScoreBig for safe and secure Texas Rangers event tickets.